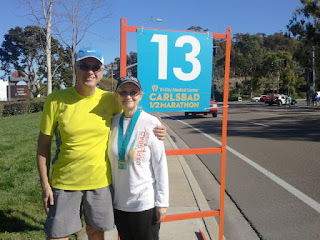 On Sunday (yesterday), my parents & I walked the Carlsbad Half Marathon! My Mom has lost over 55 lbs since last April - by joining Jenny Craig and walking almost every day! My Dad has been her walking partner whenever he can, and has gotten healthy with her. One day I walked 6 miles with my mom -- she was doing great, and I was getting tired! 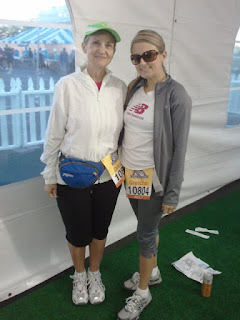 I said Mom, you could walk double this and do a half marathon! I think she thought I was crazy, but decided to sign up anyways. We did a 10 miler last weekend to practice, and yesterday was the big day. 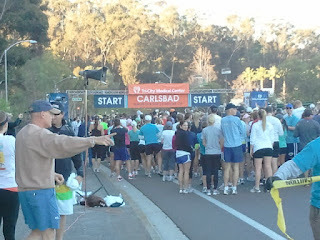 Here are the pictures of the race. 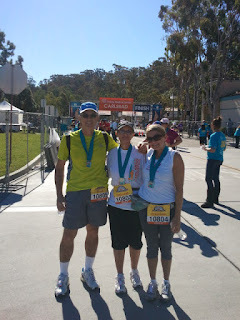 I am so happy that I was healthy enough to do this, and I am so proud of my parents. My mom has never done anything like this in her life! She is amazing and inspires me every day. They came over Saturday night and I made them some turkey spaghetti and salad for dinner. We needed our carbs! They stayed over and we all woke up at 4:15am yesterday. We had some oatmeal and fruit and we were on our way. Stopped for some coffee, and got to the expo around 6am! 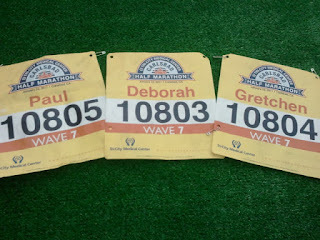 Here are our bibs! I had never seen them with the names on them, so I thought that was pretty cool. We had to wait till 7am to get in and get our t-shirts. It was pretty chilly outside, so we waited in a heated tent with other participants who were resting and stretching. There is an FRS can beside my foot down there, which I thought was pretty cool because they had a guy handing them out and my Dad used to work for their company. 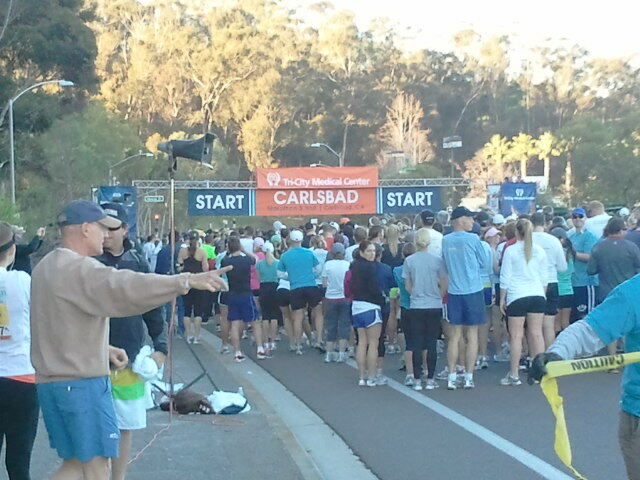 Ready to rock, in line to start the race.. 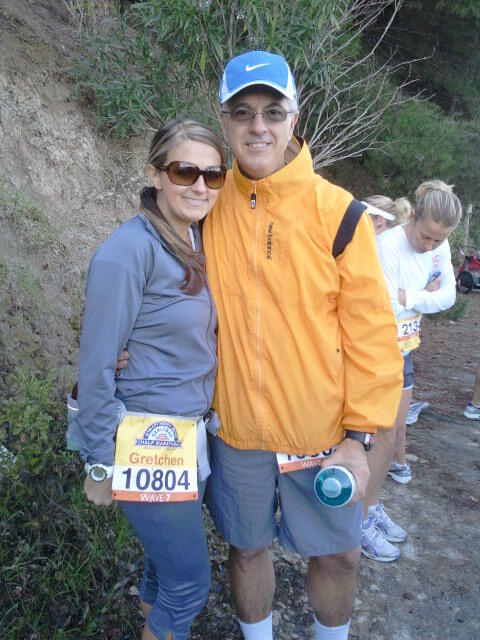 Miles 2 & 3 were a little rough for me, but we quickly got to the halfway point and stopped to use the restroom and take a photo with the amazing ocean view! 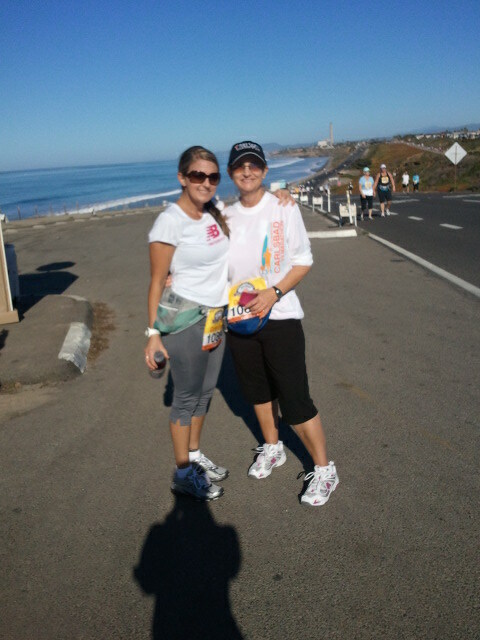 A lady named Janice walked the entire race with us because her daughters left her. She was nice and a ship shape 65+ year old lady! Wow! We struggled a bit around mile 11-12, and I had 1 more bathroom stop, then jogged back to my group. I think this hurt my knee, but I didn't want everyone else to lose time. 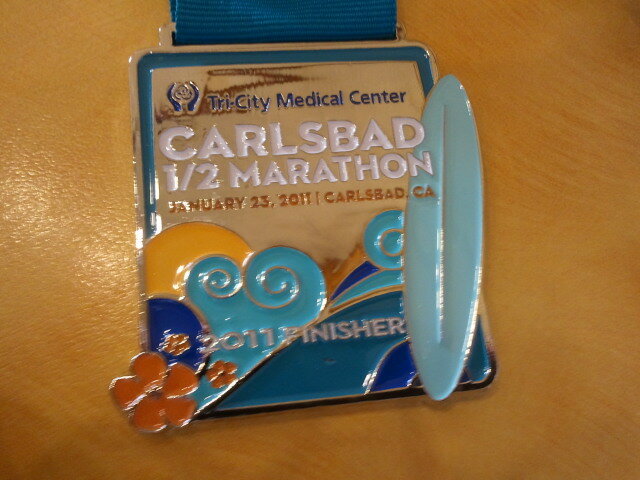 Our goal was to finish in under 4.5 hours at about a 20 min mile... and we were averaging about 18 min a mile!! Go us! 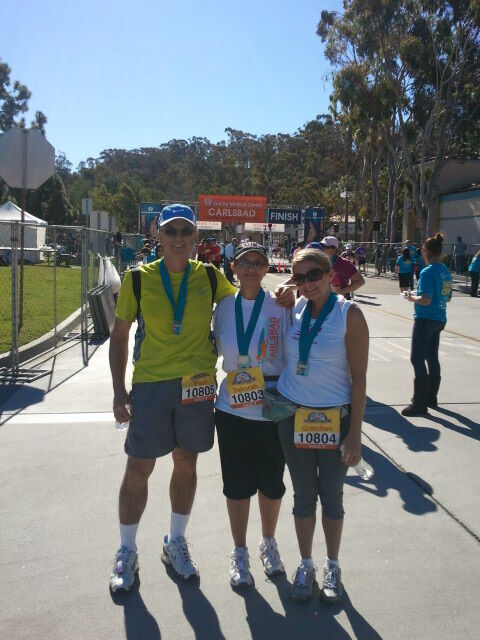 This is us after we finished! We linked arms and the announcer yelled out TEAM CANNON!!! It was a proud moment for all of us, and yes I was a bit teary eyed :). I hope the photographer got a good shot of us. AND we finished in 4 hours!! And we beat about 80 people! 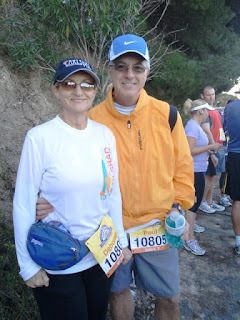 Our goal was to finish and my mom's other goal was not to come in last. So we did good! Here is my parents' victory photo! Good job, I love you!!! My mom already wants to know when/ what our next race will be!! TBD..!! Congrats guys!!! Love the pics! Thanks Matt!! It was a proud day for all of us!! !